Sean Hernandez is one of a handful of artists in Chicago making music inspired by an earlier, trackier era. 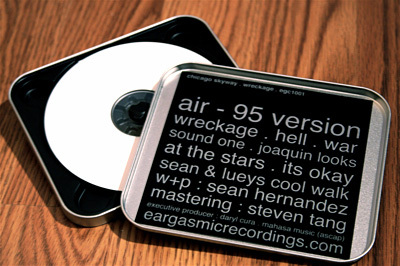 This CD-R, packaged in an aluminum tin, is his and Eargasmic Recordings’ first full-length. Buy Phentermine And Topiramate Online Wreckage opens with dopplering beats and underwater reverb on “Air – 95 Version.” Occasionally, warped moaning or chanting erupts. It’s an off-putting entrance, but at least we know not to expect all club tunes. The title track is a tightly sequenced analogue production. Its bassline squirms to speedy drum machine variations. “Hell” is a hard beat track subjected to various forms of distortion, from tape decay to heavy echo. It could have been a DJ tool in the eighties. On “War,” electronic bombings punctuate a 303 acid line. The short but sweet “Sound One” would fit in on a Mathematics compilation. Synth strings breathe in and out. “Joaquin Looks at the Stars” is even more lush, with jazzy electric piano, strings, and splashy snares. I wish it were longer. At just over half an hour, this release is just a teaser of what Hernandez could do. He has shown his mastery of old machinery. I’d love to hear him get more radical in his editing or take us on a longer drive.